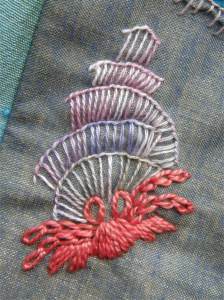 Learning how to do blanket stitch will be of great benefit to the embroiderer. 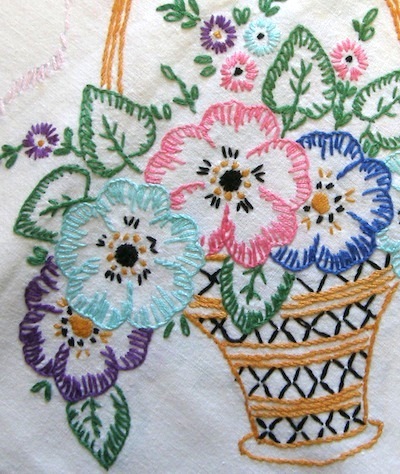 Several needlework techniques use this stitch, or variations of it. Originally stitched around the edges of blankets, it gave a decorative and practical finish. I used it for the larger flowers and leaves in the basket, and for the shell on my little hermit crab, below. 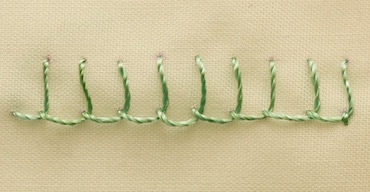 If you work the stitches close together, you have in fact, done buttonhole stitch. Most buttonholes on garments are now made by machine. This doesn't diminish the stitches usefulness in embroidery. 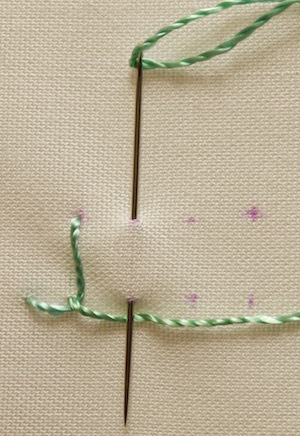 Close buttonhole stitch is an effective way of neatening a fabric edge. Both hardanger and cutwork make use of it for this purpose. In needlelace, variations on the buttonhole stitch actually create the fabric! So are you ready to learn how to do it? You can choose whether to work with or without an embroidery hoop. Which option you go for will depend to a certain extent on your tension. Working in the hand is quicker but more likely to pucker the fabric if your tension is too tight. Decide how high (or long) you want your stitches. You may like to use a disappearing ink pen to mark dots, or two lines, to ensure all your stitches end up the same length and distance apart as I have done in the photos. Bring your needle to the front side where you wish to start. We will call this point A. Take the needle back down at the first dot on the top row but don't pull it all the way through. Bring the needle point back up at the next dot along the bottom row, tuck the thread under the point and then pull the needle through the fabric. Repeat step 2 until you reach the end of your row. 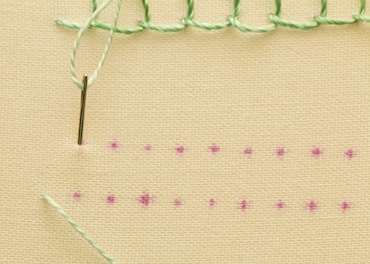 fig 3 - working "in hand"
The photograph below shows the finished row of blanket stitch. As you can see, it can be tricky to get the tension on each stitch the same with this method of stitching. In my case this was exacerbated by the fact that I used a shiny rayon thread which was slippery. If you pull too tight then a ridge can form under the row of stitches. 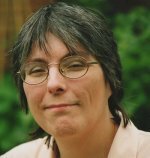 So let's look at a way to avoid these issues. 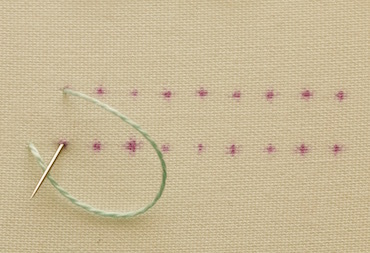 fig 4 - blanket stitch worked "in hand"
It is easier to keep the tension even by working in a hoop. If possible, secure your hoop in a stand. 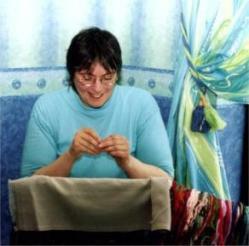 Then you will have both hands free to manipulate the needle and thread. You will need to use the stab stitch method, which is a little slower. Bring your needle up at your starting position. 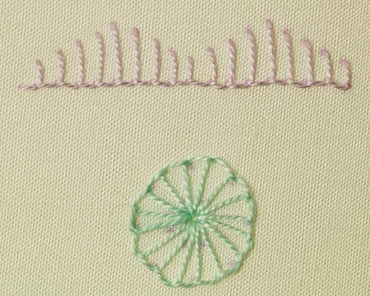 Take it back down at the top of your blanket stitch, but don't pull the thread all the way through. Instead, leave a loose loop. Bring your needle back to the front inside this loop, on the next dot in the bottom row. Then pull the thread through the fabric to "snug up" the stitch. Continue in this manner until the end of your row. Fasten off by just making a small "tie down" stitch outside of the last loop. 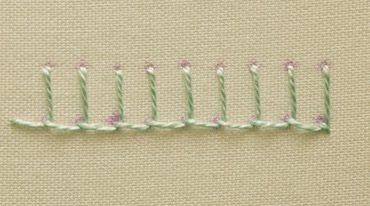 Fig 8 shows the resulting row of stitches, which has better tension throughout. This was worked with Perle cotton number 8. The pen marks will disappear within 24 hours. 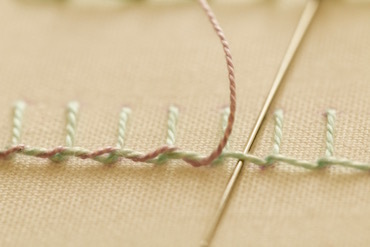 You can "fancy up" your stitches by whipping the corded bottom edge with another thread. You will get a different effect depending on the combination of threads used. Here I used the same type of thread for the whipping stitches - perle number 8. This technique is really simple, but it is even easier if you use a blunt needle. You will only take the needle through the fabric to start and stop your stitching. All other work is done by slipping the needle under the existing thread only. Of course, not all your blanket stitches HAVE to be the same length. 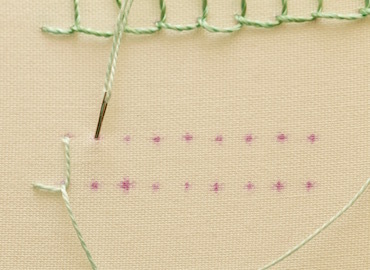 You can increase the length over a series of stitches, and then decrease again to form "hills" and "valleys" as in fig 10..
Or you can create alternate long and short stitches. You don't even have to work along a straight line! You can create circles (or wheels) by taking the needle down at a central point each time.